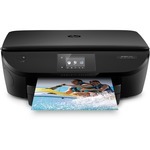 HP OfficeJet 5255 Wireless All-In-One Wi-Fi Thermal Inkjet Printer, Energy Star AT A GLANCE Print, Copy, Scan, Fax, Photo Print speed ISO: Up to 10 ppm black, up to 7 ppm color Simple Wi-Fi® setup, automatic two-sided printing, 35-page ADF. Instant Ink ready; High yield ink available Up to 50 copies at a time ENERGY STAR® qualified HP Printer Software, HP Photo Creations Included BOX CONTENTS M2U75A HP OfficeJet 5255 All-in-One Printer HP 63 Setup Black Instant Ink Ready Cartridge (approx. 190 pages) HP 63 Setup Tri-color Instant Ink Ready Cartridge (approx. 165 pages) Ink Caution Flyer Phone Cord Power Cord Setup Guide OVERVIEW Handle it all and get affordable prints. Set up, connect and print right from your mobile device, and produce high-quality photos and everyday documents. Print, scan, copy, and fax with ease. HP Office Inkjet All-in-One Printers are designed for micro/small business users looking for an all-in-one capable of printing professional-quality documents in rich, attention-grabbing color at a low cost per page. Dynamic security enabled printer. Intended to be used with cartridges using only HP original electronic circuitry. Cartridges with modified or non-HP electronic circuitry may not work, and those that work today may not work in the future. HIGHLIGHTS Wireless connectivity you can count on Get simple Wi-Fi® setup in less than a minute, and start printing fast. Have confidence in your connection with steady performance from dual band Wi-Fi®. Scan on the go, print from social media and the cloud, and easily order ink, with the HP Smart app. Easily print from a variety of smartphones and tablets. Documents and photos for as low as $2.99 a month. HP Instant Ink delivers the right ink, right on time, so you never run out again. Make an impression with Original HP ink cartridges – designed to deliver vivid color and crisp, sharp text.Create high-quality borderless photos and flyers – right in your home. Get projects done with easy versatility. Print scan, copy, and fax with fast speeds, and keep tasks moving.Breeze through tasks with hands-free printing, scanning, copying, and faxing, using the 35-page ADF.Speed through multipage print jobs with automatic two-sided printing.Create timesaving shortcuts and easily print, scan and copy directly at the printer. Powerful mobile printer with 2" display is perfect for mobile professionals and telecommuters who need a high-quality, reliable, portable printer they can take virtually anywhere. 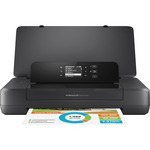 Wireless connectivity lets you simply print from your laptop or mobile devices, with or without a router. Auto Wireless connect makes setup fast and simple to let you start printing directly out of the box. Set the pace for success wherever you go with fast print speeds up to 10 pages per minute in black and up to 7 pages per minute in color. Its powerful, long-lasting battery reduces charging interruptions to keep you working for longer. And when it's depleted, just plug in your AC power source to charge it fully within 90 minutes. Plus, its premium design and quiet performance let you impress clients without noisy interruptions. Inkjet printer also features 525 MHz processor speed, 128MB DDR3 memory, up to 50-page paper input and more.